The Architectural Archives of the Province of Antwerp and the Flanders Architecture Institute are hosting an international congress as a prelude to ‘Stynen Year’ in 2018. The Belgian architect Léon Stynen (1899-1990) epitomises an entire generation of post-war modernist architects whose oeuvres and profiles share many similarities. Typically these architects were part of a strong national and international network; up-to-date and knowledgeable; prolific and varied builders (which points to great ideological flexibility); consummate professionals; and able to access large-scale, highly visible commissions. The congress aims to promote an exchange on heritage approaches to the cultural legacy of architects who are similar in profile to Stynen and to establish a dialogue regarding similar figures and oeuvres from other European regions. This will provide new insights into, amongst other things, the impact of Le Corbusier, the way in which progressive American thinking influenced architecture (and the image of architecture), and the relationship between architecture and the economic growth of the service sector in post-war Europe (which led to a profusion of office buildings). In addition, it will shed light on the development of architectural education and the way in which architecture and construction companies joined forces in rationalizing the construction process. The congress convenes on Thursday, 7 December, with a full day of presentations, followed by a keynote lecture by Prof. dr. Adrian Forty (Bartlett School of Architecture). The lectures continue the next morning, concluding at midday with a wrap-up by Prof. dr. Miles Glendinning (University of Edinburgh). 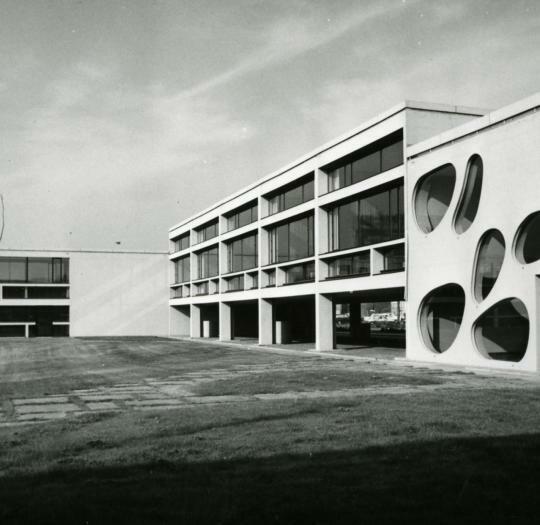 This will be followed by architectural visits planned for the afternoon of Friday, 8 December, and a post-congress tour provided by DOCOMOMO Belgium on Saturday, 9 December. DeSingel is an international arts campus integrating music, dance, theatre and architecture through exhibitions, performances and schooling. In this capacity it hosts the Conservatorium, Radio 2 and the Flemish Architecture Institute, VAi, among other offices. The building was designed in 1958 by Léon Stynen in collaboration with Paul De Meyer with an extension by Stéphane Beel added in 2007. For accommodation tips please click here. This congress is being generously supported by the cultural heritage department of the Flemish Government and aims to foster an international exchange of information about Léon Stynen and his contemporaries. It further wishes to address the preservation and interpretation of their buildings and archives from a contemporary perspective.